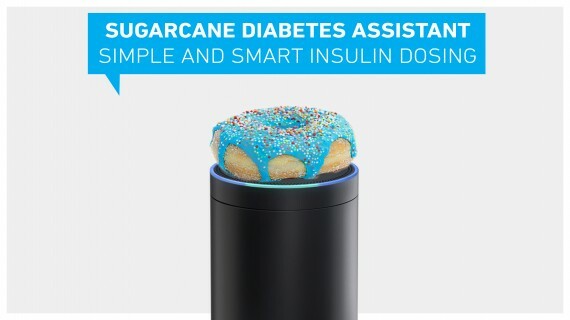 Sugarcane is a voice-enabled diabetes assistant for insulin dosing that helps people to make smarter and easier therapy decisions. According to the International Diabetes Federation, 415 million people live with diabetes world-wide. With an estimated number of 640 millions in 2040, the global epidemic is growing fast. Every ten seconds, two people are newly diagnosed with diabetes, while one person dies due to complications of their disease. Insulin is commonly used for treatment in all types of diabetes. However, dosing it right is a full-time job. Even though most people know their personal insulin exchange factors how to count carbohydrates, over 60% calculate their insulin bolus incorrectly or just “best-guess” their dose – which means they end up in a life-threateningly low blood sugars or damage their organs through high blood sugars. Existing tools for bolus calculation are printed-out carbohydrate schemes, insulin pump or app interfaces that are not necessarily intuitive to use. For certain patient groups and life situations, they are too inconvenient or complicated – especially for children, elderly people or patients with bad eyesight. All these aspects relevantly impact quality of medical care and individual quality of life. This is a perfect fit for voice-enabled assistants. Thus, the team developed an Amazon Alexa Skill during a Health Hackathon by combining their experiences as a digital designer, computer scientist, medical doctor in Paediatric Endocrinology and diabetes patient. The Sugarcane skill helps to conveniently calculate the correct insulin dosage and educates about nutritional facts. When triggered by the wake word, the voice assistant will ask for the current blood glucose level or read out real-time continuous glucose monitoring (CGM) sensor data from a cloud database. Now the user can simply tell the assistant whatever they desire to eat and Sugarcane will look up nutritional information. Afterwards, Sugarcane counts together the amount of insulin which is necessary to cover the carbohydrate intake, adjusts it to active insulin from the last dose and to factors which are dependent on age, gender, body weight, time of the day and physical activity level. These factors differ from person to person. Therefore, Sugarcane learns about personal response to the insulin dose. Data quality about food and glucose patterns is still a challenge for improving modern diabetes therapy concepts. By making data entry as intuitive as possible, the algorithm improves over time through machine learning – bringing personalized and simple medication dosing to those people who need it the most. Sugarcane solves a seemingly small thing – better bolus insulin dosing. But precise insulin dosing and continuous access to carb databases can improve therapy outcomes and finally prevent diabetes related complications and organ damage. Since the initial development, the premier goal was to make therapy decisions easy and accurate every day – for all insulin-dependent people worldwide. Therefore, Sugarcane is intended as a non-for-profit and open source project.